A closer look at the market outlook by Schlumberger Limited’s CEO Paal Kibsgaard. Schlumberger (NYSE:SLB) CEO Paal Kibsgaard is quickly becoming one of my favorite commentators on the oil market. His market commentary each quarter really puts the macro view of the oil industry into the perspective of oil prices, and he also shows how that view would drive industry activity levels. Here's what he had to say about the market, and two clear trends he sees emerging over the next year. We see two clear trends emerging. First, as we enter the last quarter of the year, the global oil market is still weighed down by fears of reduced growth in China, and the timing and magnitude of additional Iranian exports. However, the fundamental balance of supply and demand continues to tighten driven by both solid global GDP growth and by weakening supply as dramatic cuts in E&P investments start to take full effect. We expect this trend to continue and as the oil markets further recognize the magnitude of the industry's annual production replacement challenge, this will gradually translate into improvements in oil prices going forward. While the market focuses on Chinese demand and Iranian supply, they are missing the fact that the oversupply is shrinking. Kibsgaard noted that demand for oil accelerated this year and is currently at more than 95 million barrels per day, which is 1.8 million higher than demand last year. Demand growth is now at a five-year high, according to the International Energy Agency. And while the agency does see demand growth slowing next year, it still expects worldwide demand to increase by 1.2 million barrels of oil per day in 2016. Kibsgaard also noted that supply growth has weakened because of drastic cuts in investments by oil producers. As a result of these cuts, oil production has started to slip because of the natural decline rate of an oil well. 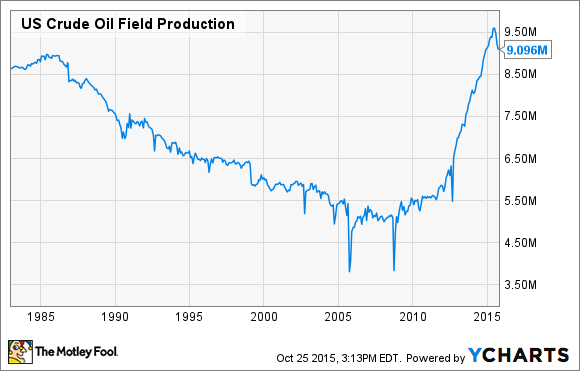 We can see this decline very clearly by looking at the following chart of U.S. oil production. The net result of these two factors is a much more balanced oil market, which in Kibsgaard's view will translate into higher oil prices in the future. In spite of the expected improvements in oil prices, the market outlook for oilfield services looks challenging for the coming quarters, as we expect additional reductions in activity and further pressure on service pricing. This is driven by the financial pressure on many of our customers where a year of very low oil prices is now exhausting available cash flow and corresponding capital spending and also leading them to take a very conservative view on 2016 E&P budgets. Based on this industry outlook, we expect E&P investments to fall for a second successive year in 2016, which is the first time since the 1986 downturn. In other words, despite a view that oil prices should begin to improve, Kibsgaard expects that oil and gas budgets will go down again next year. U.S. onshore-focused E&P budgets in particular are expected to be under pressure next year. After falling 45% this year, the current view is that these budgets will be cut by another 20% next year. Some cuts could be even more dramatic, with Whiting Petroleum (NYSE:WLL), for example, potentially cutting its 2016 capex budget from $2.15 billion this year to $1 billion next year. Such a cut by Whiting Petroleum would enable it to live within its expected discretionary cash flow of about $1 billion at a $50 oil price. Because of this focus on living within cash flow, the near term will still be challenging for oil-field service companies as well as others in the industry, such as drilling contractors, frack sand providers, and equipment makers. We instead see an increasing likelihood of a timing gap between the expected improvement in oil prices and the subsequent increase in E&P investments and oilfield services activity. This timing gap or increased response time is a direct consequence of the dramatic cost in E&P investments, which have clearly damaged the oil industry's financial strength and investment appetite as well as the operating capacity and capability. So while our macro view has not changed in terms of a tightening supply and demand balance and an expected improvement in oil prices, we have to factor in that the likely recovery in our activity levels now seems to be a 2017 event. In other words, Kibsgaard doesn't expect that oil and gas drilling activity will improve in lock-step with oil prices, meaning that activity levels won't improve until 2017, when new, higher budgets are set. That's because oil producers such as Whiting Petroleum are expected to use the excess cash generated from higher oil prices to repair their bruised balance sheets. In Whiting's case, it has more than $5 billion in debt, which is a lot for a $9 billion company, and why companies like it will likely use any excess cash flow to pay down debt next year. Schlumberger CEO Paal Kibsgaard had good news and bad news for the oil industry. The good news is that he sees supply and demand returning to balance, which should lead to higher oil prices. That's exactly what beleaguered oil companies such as Whiting want to hear. Having said that, those oil companies are expected to hold off on increasing their drilling budgets and instead are expected to use the extra cash from higher prices to boost their balance sheets. That's bad news for oil-field service companies such as Schlumberger, as well as drilling contractors, frack sand producers, and equipment makers, because it means that their recovery is still at least another year away.